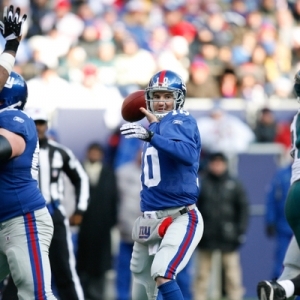 The New York Giants had everything going wonderfully through the majority of 2008. After riding a big wave of momentum from a stunning upset in Super Bowl XLIII, the defending champions backed up their impressive season by jumping out to a dominating 11-1 start. Everything seemed to be going perfect and the Giants posed a big threat to go back-to-back. However, things would quickly take a drastic turn. Some of the problems could be blamed on Plaxico Burress. Burress had off-the-field troubles stemming from an accidental self-inflicted gunshot wound in late November. Burress would never return to the field and is still facing legal trouble as the upcoming season approaches. The loss of Burress on the field and the possible distraction it caused may have been reason the Giants faltered down the stretch. New York lost three of their last four games to close out the season after the incident. Even though their overall record was still strong enough to be best in the NFC at 12-4, the Giants late-season troubles raised lots of questions. The sudden collapse of the offense was not only shocking but confusing considering how well the team had played all year. The team went from averaging just less than 30 points per game to posting only 18 points per game in the final month of the season. The frustration boiled over when the Giants were knocked out of the opening round of the playoffs by Philadelphia, 23-11. With Burress out of the picture and some other losses on offense, many are questioning which Giants team we will see in 2009? New York will return one of the best offensive lines in the league. The big guys who paved the way for running backs Brandon Jacobs and Derrick Ward were a big reason the Giants were the No. 1 rushing offense in the NFL. However, that is not to take away from the tremendous job both tailbacks did as each racked up more than 1,000 yards. Jacobs got the majority of the carries and will be the lone rusher in the backfield in 2009 due to Ward’s departure to Tampa Bay. The loss could impact the running game in a big way considering both backs strived off of each other. The Giants running game cannot afford to take a step back considering how poor the passing game fared towards the second half of the season. Eli Manning ranked towards the bottom of the NFL, completing just 60.3 percent of his passes. The receiving corps failed to impress as the Giants were the only team in the league without a single receiver with more than 600 yards. New York will need help from young receivers Domenik Hixon and rookie Hakeem Nicks if the team is to experience similar success on the offensive side of the ball. The Giants defense could be the big difference maker this season. New York ranked in the Top 5 in overall defense last year and was able to bring down the quarterback 42 times. This unit will get star defensive end Osi Umenyiora back after he missed the entire 2008 season due to a torn MCL. Umenyiora should allow the defensive front to be even stronger considering he was able to earn 13 sacks in 2007. Also, the secondary should be improved as well after they were a Top-10 unit last season against the pass. Kenny Phillips is a big-time safety in the making at just 22 years old and the entire secondary has the chance to become among the best in the NFC as they continue to show improvement. The New York defense could very well be the best in the NFC and that is a reason many have the Giants as large favorites to make a run at the conference title. However, the defense was plenty strong enough last season to claim those type of accomplishments. The true test of this team will rest on the performance of the offense. The offensive front should give the Giants all the ingredients to be successful, but there are still some questions that are looming. Brandon Jacobs should be able to carry the workload and have a successful season. However, will Jacobs be able to make up for the passing game if it continues to struggle? 2009 New York Giants Predictions – The Giants may have some concerns, but they have excellent offensive and defensive lines. They will get the job done in the trenches and their defense will win games. How much success they experience lies with the offense. Unfortunately, this could be the year the Giants are exposed as a one-dimensional team on offense. The best team in the NFC a year ago will take a big step back this season as they are unable to find immediate answers from last season’s collapse and fail to reach the 10-win mark. A disappointing 9-7 record and third place in the NFC East will have Giants finds scratching their heads again. For my NFL picks, I will probably mostly stay away from the Giants.